COWI is a North European consulting business, specialized in engineering, environment and economy all over the world. COWI has 11 regional offices in Denmark. 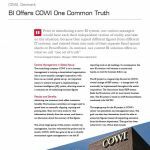 The consulting company COWI is on a journey: Management is turning a decentralized organization into a more centrally managed corporation with focus on an overall, global set-up. An important means to achieve that goal is implementing a business intelligence (BI) system, allowing access to a common set of underlying business figures.